But is it true, is your code “Legacy” ? I asked myself this question, and decided to do some research on the subject. I tried to figure out how one applies the adjective “Legacy” to code? I’ve worked on Android a lot recently, so I will relate the discussion to this platform. I recently joined ContentSquare, and I was lucky enough have the ability to directly affect both Mobile platforms. I started looking into the tools of the trade, and also what I want to do, and eventually implement the same safety net on both platforms. Were equipped with all the usual tools. We use GitHub, and we have a Jenkins server which runs our builds. Our usual process uses the feature branch approach. What we also decided, is to disable direct commits to master, meaning we only can push code to master through a branch merge with a pull request. Doing this on GitHub is super easy. Just go to your repo settings, and select protect this branch. What we just did is disallow anyone to commit and push directly to master. From now on we have to go through a pull request which will be reviewed by at least one person. With the pull request, we notify everyone of the change, allowing them to know the development of the code by review. Using the peer reviews we get to reduce the amount of bugs as people notice when someone is taking a shortcut. For the time being, our build loop is very simple. OK, now off to finding the tools we’re going to use. As a requirement, we decided to only use tools which integrate through gradle. This would allow us to have completely seamless integration. As lint is a common tool I will not go into details about it, instead I will just show you how to enable it. Lint is a part of the android plugin, but by default it’s not configured on new projects. To enable it, add the following block to the android section of the build.gradle file. Ok, so now that we have lint done, we need to actually run it somehow. Gradle’s android plugin has a quite a few pre-defined tasks, which you can get a complete listing of by using the option tasks. createDebugCoverageReport - Creates test coverage reports for the debug variant. I like check which is described simply as “runs all checks”. For this moment this is all we need, and due to it’s nature, we will link all future checks to this task. So, next I was reading up on PMD, Findbugs and discovered Facebook’s Infer. PMD is a source code analyzer. It finds common programming flaws like unused variables, empty catch blocks, unnecessary object creation, and so forth. PMD works on source code and therefore finds problems like: violation of naming conventions, lack of curly braces, misplaced null check, long parameter list, unnecessary constructor, missing break in switch, etc. PMD also tells you about the Cyclomatic complexity of your code which I find very helpful. check.dependsOn ‘pmd’ — this line links the PMD task with check. Which means, when we call gradle check, it will call pmd as a dependency task. 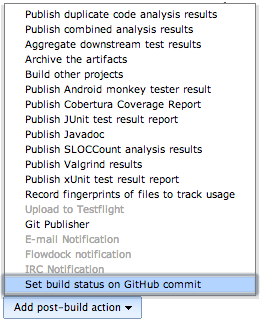 This way, the team can get used to just calling gradle check and know all relevant checks are done through this task. ruleSetFiles — defines the set of rules and specifics which are to be used in this installation. reports block — defines all the requirements in terms of what to scan, what to ignore, and where to report. FindBugs is an analyzer which detects possible bugs in Java programs. Potential errors are classified in four ranks: (i) scariest, (ii) scary, (iii) troubling and (iv) of concern. This is a hint to the developer about their possible impact or severity. FindBugs operates on Java bytecode, rather than source code. ignoreFailures = false — defines whether any discoveries are used as warnings or errors. effort — Set the analysis effort level. Enable analyses which increase precision and find more bugs, but which may require more memory and take more time to complete. reports = the location where the reports will be saved. Infer is a static analysis tool for Java, Objective-C and C. What was nice about infer is the fact it double checks all `@Nullable` vs `@NonNull` annotated variables and has some Android specific checks which were of interest. Infer is a standalone tool, which means that by default it doesn’t integrate with Gradle, however, good guy Uber developed a Gradle plugin for Infer. To add this analyzer to our build process, we again add to Gradle. Adding this plugin is quite straightforward, we only define the sources which are to be included and excluded from the check. Now that we have some analyzers, call ./gradlew check and see what happens. However defining the code style was a pain! I just modified the “code formatting template” in studio and within 10–15 mins, I was all set. ProTip: if you want to constantly auto format your code, IntelliJ has you covered. You can easily record a macro, which will, rearrange code, re-order imports, remove unused imports, as well as do any other style related operations. When done put a “save all” at the end. Next, store the macro and assign it to ctrl+s. These settings, can be shared to the team, and it automagically works for everyone. Quite straight forward for java, we need to generate a Javadoc. Step1: Require a JavaDoc comment on all public methods, through Checkstyle, already done in the default rules. For this task we’ll use Jacoco, a java standard. description = "Generate Jacoco coverage reports after running tests." So, similarly by calling ./gradlew coverage in `build/reports/coverage` you would get a very nice coverage report page. An important thing, in order to reduce code smell, was to break if developers forget code, used for debug purposes or comment out code in hopes of future use. There is a quick fix for this, just add these rules to your checkstyle rules set. 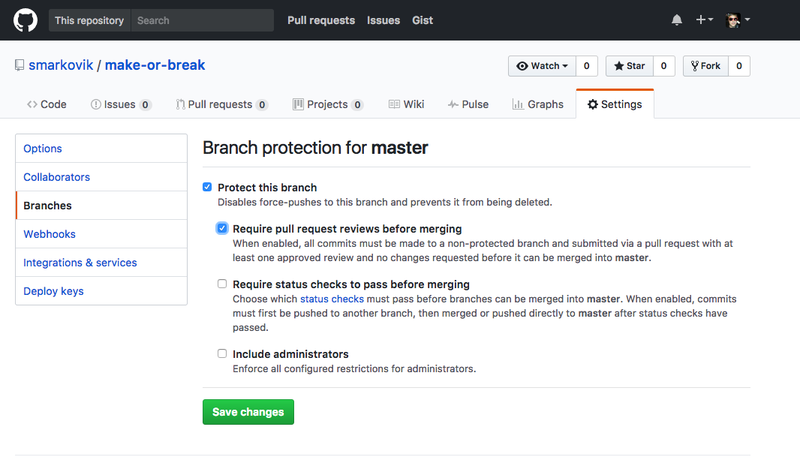 So now that we have our checks in place, at last we need to set Github to disallow branch merges unless our Jenkins build passes. Nice, now all you’re left to do is focus on the architecture of the code and continue improving your system. A sample code project implementing most of the above can be found on my github repo, https://github.com/smarkovik/make-or-break .